Finalists will be announced over All-Star weekend in Houston in February. The Hall of Fame’s Class of 2013 will then be revealed during the Final Four in Atlanta in April. If Reinsdorf becomes a member this year, it would mark the fifth year in a row someone with Bulls ties is honored. In 2009, Michael Jordan and Jerry Sloan were inducted, while the late Johnny “Red” Kerr received the John W. Bunn Lifetime Achievement Award and Doug Collins the Curt Gowdy Media Award. The following year, Scottie Pippen was enshrined. In 2011, Dennis Rodman, Artis Gilmore and former Bulls assistant coach Tex Winter were enshrined. The late Jim Durham was named as the recipient of the 2011 Curt Gowdy Media Award, while former Bulls PR executive Brian McIntyre received the 2011 John W. Bunn Lifetime Achievement Award. Last fall, Chet Walker was a member of the Hall of Fame’s Class of 2012 and Bulls.com journalist Sam Smith received the 2012 Curt Gowdy Media Award. 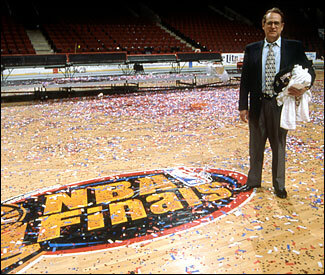 Reinsdorf became Chairman of the Bulls on March 13, 1985, after leading a group that purchased controlling interest in the franchise. During his tenure, the Bulls have won six NBA championships, third most among NBA franchises to the Boston Celtics and Los Angeles Lakers, both of whom have been in the league longer. In the NBA, only one other owner has won more championships during their tenure than Jerry Reinsdorf—the Lakers have won 10 championships under Jerry Buss, a member of the Hall of Fame’s Class of 2010.